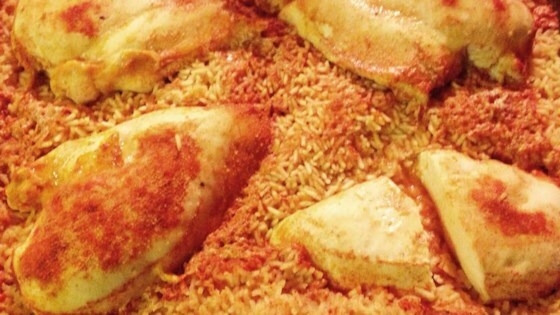 "Chicken breasts baked on a mixture of chicken broth, rice, paprika and lemon pepper. A quick, easy and delicious chicken recipe that my father taught me." Pour chicken broth into a 2 quart casserole dish. Fill a can with rice (approximately 1 3/4 cups), and stir into broth. Season with paprika and lemon pepper to taste. Place chicken breasts on top of rice mixture, and sprinkle with more paprika and lemon pepper to taste. Cover, and bake in preheated oven for 50 to 60 minutes, or until rice is cooked through and chicken is no longer pink inside. Serve immediately. The rice ingredient amount was reduced by the Allrecipes Staff on 6/18/2009. This recipe must be wrong be cause the rice is to much and is taking to long to cook. TRY a 5 1/2 of cooked rice is what I say ,because uncooked rice didn't work.